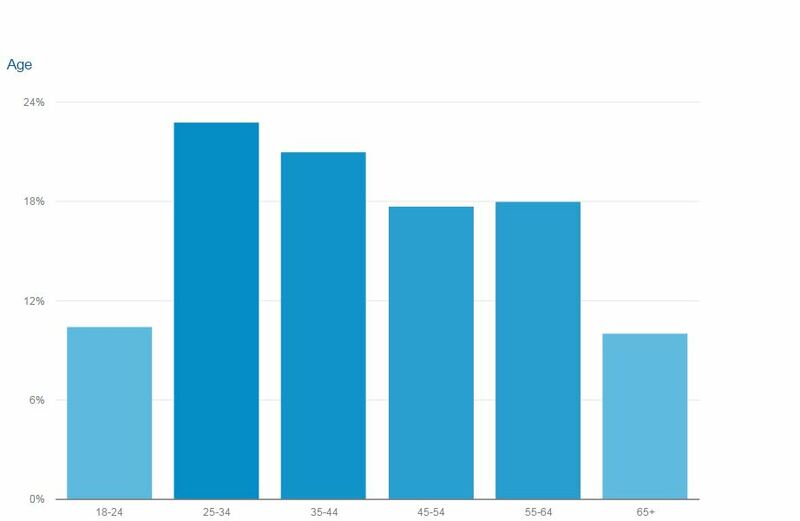 Chart from Google Analytics shows the age distribution of readers in October. The Times of San Diego website was read by 177,172 different people in October, most of them young and using smartphones or tablets. The news website, now a year-and-a-half old, is attracting a growing audience by publishing 20 to 25 articles daily about all aspects of life in San Diego, from politics to crime to business to the arts. A daily newsletter with top stories is published at 8 a.m. The largest group of readers is in the 25 to 34 age range, accounting for 23 percent of reading sessions. Nearly three-quarters of readers are under the age of 55. Over half of reading sessions were on smartphones and tablets, and the most frequently used devices were the Apple iPhone and iPad. The most popular story of the month was Times’ coverage of the California Coastal Commission ruling on SeaWorld San Diego’s proposed expansion of killer whale tanks. followed by a guide to Halloween activities and an article about a La Jolla man beaten in New Orleans. Readers in Southern California accounted for more than half of the traffic to the site, with the city of San Diego alone getting 27 percent. Other traffic was national and even international, some of it from San Diegans who were traveling. The website’s audience data is tracked by Google Analytics, the most frequently used measurement tool.